In June 2017, the LA Times published this story by Samantha Masunaga about Sue Finley and her long career at JPL (which at 80 years of age - is still going strong!). Finley is a great role model for learning and exploring new frontiers! 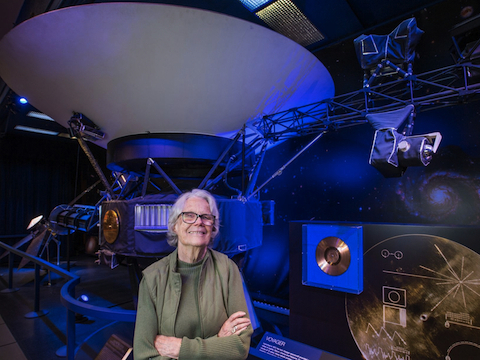 Finley is pictured in the photo (by LA Times Allen Schaben) next to a model of the Voyager 1 space probe. Finley worked on Voyager in the 1970s. From her start as a "human computer," she went on to work on projects such as the Venus Balloon Project, for which she wrote the program that automated movement commands for a DSN antenna. She also helped design the special tones emitted by spacecraft that correspond with actions taken. Finley loves learning something new every day and is now helping to design and test a new, pizza box-sized receiver for the DSN. She is also working on a concept to allow small satellites to transmit data by intercepting the beam of a larger spacecraft’s antenna. Click to read the full article via the LA Times website.